This article explains what a connector is, how to use it and how to configure the connectors of a DiagramShape object in Telerik ASP.NET Diagram component. A sample configuration of the described properties can be seen in Example 1. The DiagramConnector is a visual intermediate between the Connection and the Shape. It represents the attachment point of a Connection to a Shape. 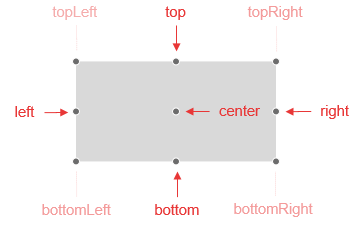 Connectors are part of a Shape's definition and you can specify the binding of a connection to a shape directly via the shape or via one of its connectors. If you specify a shape as a connection's endpoint the auto-connector will be used. This means that the endpoint of the connection will switch to the most convenient (in the sense of shortest path) connector automatically. If you specify a shape's connector as an endpoint for a connection the endpoint will remain attached to that given Connector instance. Defines the connectors the shape owns. By default each shape has five active connectors – four for the directions and one auto connector. You can control the active connectors of a shape by adding them to the shape’s ConnectorsCollection. Through the DiagramShapeConnector object you can configure the values of its properties like Name, Description and Position. Name—defines which of the nine predefined connectors to be enabled. The available values are: auto, bottom, bottomLeft, bottomRight, left, right, top, topLeft and topRight. Position—the function that positions the connector. It can be used in order to add custom connectors to a custom shape.